My mother, Eva Mower, was born in Tilbury in 1917 and lived there until 1940. Hart’s butchers shop was situated in Calcutta Road. In this photo you can see part of the sign for Cramphorn Ltd seed merchant, the shop next door. hi i am currently trying to do a family tree into the Hart family of Thurrock essex . 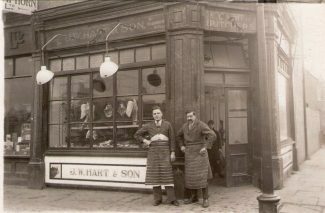 I know they were Butchers and had a abattior in tilbury. Do you know when John William Hart Died? I have him in my tree and he Married mt *4 gt Aunt Sophia Bannister. The two gentlemen in this photo are John William Hart and his son John Charles Hart. JW was my 2xgreat uncle. I am currently researching the family’s history, but know very little at this stage other than he was a Butcher! Sorry for taking so long to respond to your posts. I’m afraid I don’t know who the men in the photo are, David nor do I know the date of the photo. It has a postcard back but no details of the publishers. As it wasn’t postally used there is no postmark to give a clue as to the date. Certainly you may copy it Evie, but sorry I can’t give you any more information. My Aunt Win Jolley nee Seaman worked in the St Chads Road shop certainly in the fifties may even the late forties as a cashier in the the little booth by the counter! My father managed Harts through 50s-70s. He also worked in the St Chads Road shop, the branch in Chadwell and in Linford.